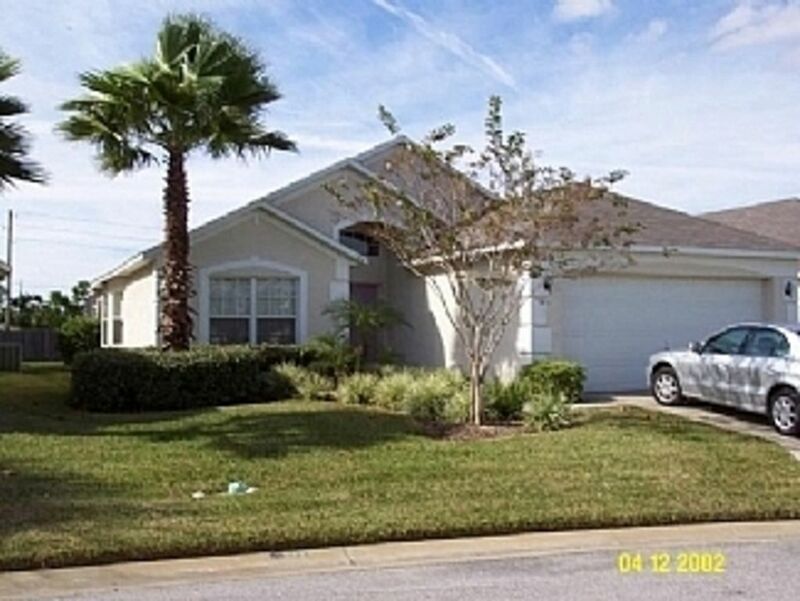 Lavender House is located in the Manors, North at Westridge which is located west of Disney world, Orlando which is about twenty minutes drive away. Orlando international airport is about forty five minutes drive away. It has three double bedrooms two bathrooms. The screened westerly facing heated pool overlooks a conservation area. The kitchen and laundry room are fully equipped and there are two TVs, a CD and DVD player. It is very close to the Manors at Westridge Club House which has a community pool, new fitness room, lounge with TVs and kitchen, reading room and free Wi-Fi internet. The master bedroom has an en-suite bathroom with bath/shower and wc. Bathroom two has a bath/shower and wc. Lounge - two piece suite, two bar stools, Cable TV, radio, CD and DVD player. There are several books available to read. There are many golf courses located close to the villa. Notes on accommodation: There are alarms on all doors and windows leading to the pool area. Outside: There is a garden at the front of the villa. The screened pool patio at the rear overlooks a conservation area. The pool can be heated and is private. There is a table, four chairs and two loungers in the patio area. Utility Room: Washing machine, drier, iron and ironing board. Cleaning / Towels / Linen: Towels and linen are included. They are changed before every new rental. Very nice home in a very quiet neighborhood. Enjoyed our stay at the Lavender House. Clean with everything we needed.Would definitely stay again. The only problem was that the refrigerator needs upgraded as the bottom drawers kept coming apart and the bottom shelf on the door came apart causing the loss of a few bottles of my favorite beverage. Overall a very nice home with a nice pool...Thank you Adele. I am glad you enjoyed your stay in the house. I am sorry to hear about the fridge. I will review with the manager and check regarding repairs/replacement. Look forward to having you stay in the future. The Lavender house, a perfect place to stay. I stayed for the second time in the Lavender house and again it was a great holiday. Clean, quiet and safe neighborhood, well furnished. Good connections to highways and attractions. Can recommend this House for the full 100%. I will certainly return. We are happy to have you stay in the house again, and look forward to welcoming you in the future. Great villa great safe location. Nice villa in a very peaceful and safe community. Communication with the owner was first class. And our security deposit was refunded very quickly after our stay. Thankyou Adele for letting us stay at your home it had everything we needed. We look forward to welcoming you again to the home. We were 4 adults, 2 children and an infant. This home was perfect for us. Close enough to the Disney parks AND we did not have to travel Hwy 4 to get to them! Everything was in good working order. We did not use the pool since the pool heater was broken but it didn't matter as we were there during a deep freeze in the south. Even Orlando was too cold for swimming outdoors. The beds were super comfy (LOVED the memory foam mattress in the master bedroom!) and we had plenty of blankets to stay toasty warm. Adele was easy to work with and answered all questions via email. If you're planning an Orlando vacation, look no further. This home has everything you need. Thank you so much for your review, and we are pleased that you enjoyed your stay. Yes unfortunate that the heater decided to break at that time, but i am pleased to report that a new heater has been installed. I am glad that everything else was satisfactory. Great property and well maintained. Nice place for a family vacation. Thanks very much, i am pleased that you enjoyed your stay at our home. What a fantastic house we really enjoyed our stay here,everything was great as we walked in we had the wow factor ,very well equipped, home away from home.The pool was great very private and we sat outside most nights while our son played in the pool.On a great estate at the entrance to westridge there is a great pizza shop and not far from that is Berry Town with a Publix and we ate at Applebee's which was a real treat ,in the other direction you have lots of different places to eat and not far from Champions Gate with another Publix and chinese also a mcdonalds which was great for a quick breakfast or to pick up food on way back from theme parks to eat by the pool,we can not recommend this lovely villa enough and hope to return one day . The closest beach west of the villa is Clearwater situated on the Gulf of Mexico. It takes about one and a quarter hours to drive to Clearwater. The closest beach east of the villa is Cocoa Beach (just south of Cape Canaveral) situated on the Atlantic Ocean. This is about one hour's drive away. Orlando international airport - about forty five minutes drive away. St. Petersburg about one hour and a quarter drive. Walt Disney World about twenty minutes drive. Kissimmee about thirty minutes drive. Cape Canaveral about one hour drive. Universal about forty minutes drive. The local supermarket is about five minutes drive away. The closest restaurants are about five minutes drive away. The closest bank is about ten minutes drive away. Booking Notes: A deposit of 25% is required to confirm the booking. The balance should be paid one month before the clients arrival date at the villa. Changeover Day: Changeover day is flexible as well as the arrival and departure times. Notes on prices: Prices are for the property per week in UK pounds. Pool heat costs £35 per day the pool heater is switched on. We ask for a 25% deposit to confirm the booking. The balance should be paid about one month before you depart. We ask for a security deposit of £300.